Keira Johnson, a 50-year-old mother of two grown sons, believes she lives a good Christian life without secrets-until she discovers a life-jarring fact her late mother kept hidden all her life. Kiera was born out of wedlock, and the man she had always known as her father had adopted her as an infant. Meanwhile, Keira's beloved 17-year-old niece, Kirsten, has just discovered an unwanted pregnancy. Her boyfriend, Jose, is bound for college and Kirsten does not know what to do. As the family comes together for a reunion, Keira and Kirsten struggle with their fractured pasts and jumbled present. Will truth and honesty be the catalysts that allow the entire family to find peace? 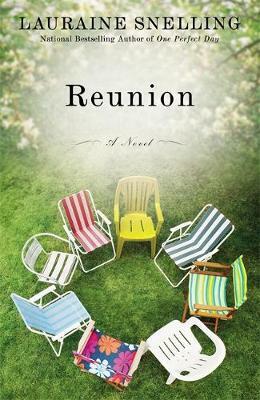 Inspired by events in Lauraine Snelling's own life, REUNION is the author's finest novel to date. "Inspired by events in Snelling's own life, REUNION is a beautiful story about characters discovering themselves as the foundation of their family comes apart at the seams. Readers may recognize themselves or someone they know within the pages of this book, which belongs on everyone's keeper shelf." "RT Book Reviews""
"Snelling writes about the foibles of human nature with keen insight and sweet honesty." "National Church Library Association""
"REUNION is a captivating tale that will hook you from the very start....Fans of Christian fiction will love this touching story." "FreshFiction.com""
"Snelling's previous novels (One Perfect Day) have been popular with readers, and this one, loosely based on her own life, will be no exception." "Publishers Weekly""